The Mukhtarov Residence which became the Wedding Palace during the Soviet period. The statue which is affixed to the crown of the building but from which the contractor slipped and fell to his death while trying to secure. 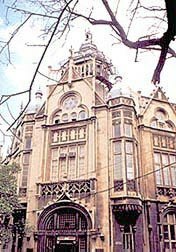 One of the largest mansions in the city, occupying nearly an entire city block, belonged to Oil Baron Murtuza Mukhtarov (1855-1920). Mukhtarov, known for his drilling expertise, founded a large oil company with two divisions, employing 2,500 workers. The companies manufactured machinery for derricks and drills for new wells. Mukhtarov married Liza Taghinova, the daughter of an Ossetian nobleman. Impassioned travelers, the couple traveled throughout Europe. When his wife expressed delight in one of the French Gothic palaces, Mukhtarov obtained the plans, and hired the famous Polish architect I. K. Ploshko to modify it for Baku. The mansion was built in 1911-1912. A tragedy occurred during the construction of this building when one of the contractors, Imran Gasimov, accidentally slipped and fell to his death while trying to erect a statue on the crown of the building high above the entrance. A week later, Gasimov's wife, Rubaba Khanim, committed suicide, realizing that either she would have to leave Baku or start wearing the chador (veil), like other Moslem women. They had no children. The classical statue, bearing witness to this great tragedy, can still be seen today. In 1914, Liza Khanim organized the first Female Moslem Philanthropic Society, which set up a boarding school for poor and orphan girls inside the palace. The lives of Mukhtarov and Liza Khanim also ended in tragedy. Mukhtarov hated Stalin and the Bolsheviks. Shortly before the Red Army entered Baku in April 1920, he declared, "As long as I'm alive, no barbarian will enter my house in soldier's boots." When Bolsheviks charged into his Palace up the grand staircase, riding their horses, he fired at them and then turned the gun on himself. Soviets confiscated the property and Liza Khanim was forced to live in the basement of the palace that had been built for her. She eventually arranged a way to escape to Istanbul with a diplomat only to be robbed by him. She died in the mid-1950s. Fortunately, the enormous building with its elaborate highly decorative rooms and high ceilings was not subdivided into apartments but rather designated as a Wedding Palace where young couples come to register their vows. Today, it still serves that purpose and ironically is called the "Palace of Good Fortune." The Composers' Union also maintains offices in one end of the building.